Quick start: If you’re good at chess and just want to give Persian Chess a quick start, please go to the Play! page and choose “Celtic Citadel” as your sub-variant. To play Persian Chess, you should know how to play chess. All the standard FIDE rules like castling, en-passant, fifty moves, check and checkmate, promotion and under-promotion, etc. also apply to this game. If you can’t play chess yet or still unsure about some of the FIDE rules, then please proceed to this page where you can find detailed information about the rules of chess. If you don’t want to spend time to learn the standard FIDE chess rules, but still want to be able to play Persian Chess, well, you simply can’t. Persian Chess is chess and you need to know the basics first. The exceptional rules for this game are documented in 2 sections: basic rules and sub-variant rules. Basic rules are applied to all sub-variants of the Persian Chess. Persian Princess, Egyptian Eye and Oriental Omega sub-variant are played with their own variant rules. But if you are already familiar with the basic rules then you can play Celtic Citadelbecause this sub-variant has no extra variant rules and is simply being played with the basic rules. In other words, Celtic Citadel is the fundamental sub-variant of the Persian Chess. The Egyptian Eye is the most advanced/complex sub-variant where a new chess piece is for the first time introduced to the game of chess: an strange and unpredictable chess piece that is neither white or black, and attacks both players simultaneously! (white Princess on g2 square and black Princess on g10 square) which are compound pieces and moving like Bishop AND Knight. (white Fortress on a1 and k1 squares and black Fortress on a11 and k11 squares) which are compound pieces and moving like Rook AND Knight. All FIDE rules apply: if a king moves in the game, or is in check, or the castling squares are attacked, then castling is not possible. This is a historical Citadel rule that was applied in the game for hundreds of years in this family of chess games, and is not by any means “new” to Persian Chess. To be more clear: if white king moves to a11 or k11 (the Citadel squares for black) or if black king moves to a1 and k1 (the Citadel squares for white) then disregarding the game position or material balance, the game is drawn. By knowing how to play chess, how to castle and how Princess and Fortress move, you can start playing this sub-variant. Persian Princess start position is shown in the below diagram. Note the difference in the position of bishop and Princess in comparison with Celtic Citadel. In Persian Princess there are 2 dark bishops at each side in the start position. This can change during the game by the “Rendezvous” rule. The difference between Rendezvous and castling is that player is allowed to Rendezvous even if Princess and bishop are moved, or by any of the dark square bishops. They just need to be positioned on g2 an h2 (for white) and g10 and h10 (for black) in any stage of the game. 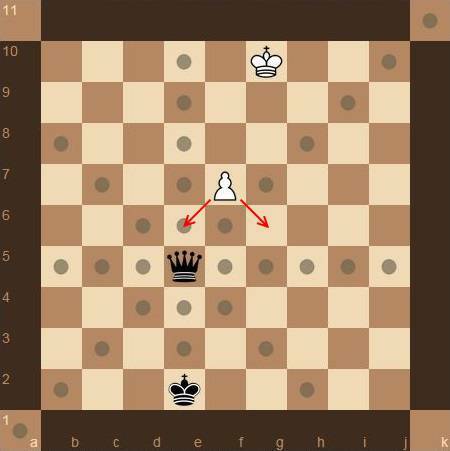 Players are not allowed to Rendezvous when they are in check (obviously) because rendezvous cannot defend your king from check, so you need to defend the king first, or move the king out of the attacked square before being able to rendezvous. 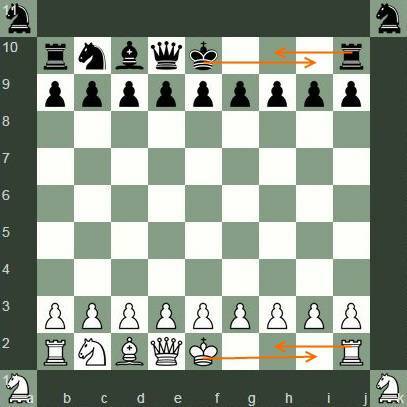 Only pawns and princess are allowed to move to the center square (f6). That is (more or less) the reason why this sub-variant is called Persian Princess. No other pieces (including kings) are allowed to the center square. During a game you might see this simple rule gives the Princess many advantages and even sometimes (in the middle and end game) a higher power and value, comparing to queen and fortress. a) because no other pieces except pawns and princess are allowed to the center, a Persian Princess on the center square can only be captured by the enemy princess or pawns and she is immune to other attacks. (if other pieces can’t move to the center square, they also can’t attack it) therefore a princess on center square has a higher value that queen. b) Persian Princess is the only piece on board which is able to attack 2 long diagonals and therefore all 4 Citadel squares simultaneously. With the Persian Princess on the center square (if her attack is not blocked by other pieces) the opponent king cannot use the Citadel squares, which makes the Citadel draw rule impossible. This sub-variant was initially published as “Chess911” so it is basically the same game. The same rendezvous rule as the Persian Princess variant also applies here. The Center Square is occupied by ASE (All Seeing Eye: from the Egyptian mythology) which attacks the diagonals. ASE attacks both players simultaneously (depending which player is to move) but it does not move itself. Therefore ASE attack does not capture a piece. What means an attack without the possibility to capture? 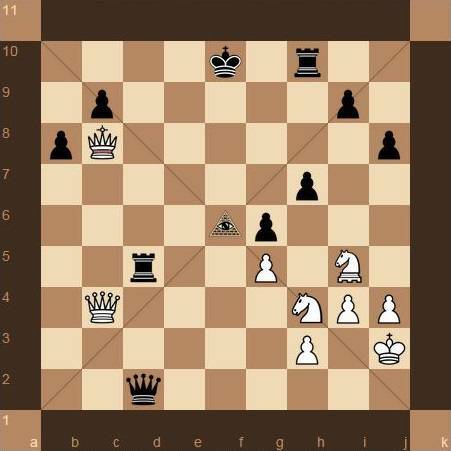 Two squares of e6 and g6 are attacked by the white pawn. Black queen won’t move to e6 because it will be captured by the white pawn. 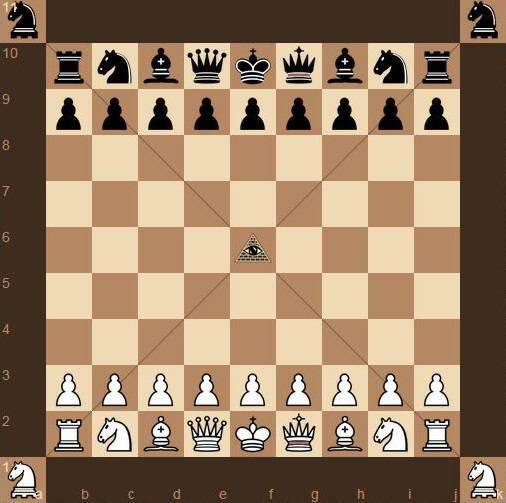 Now imagine the white pawn can not move to the e6 square in the next move (somehow by a chess rule), now you can move your queen to e6 if you want to, because even e6 square is attacked by the white pawn, you are sure that your queen will not be captured in the next move. 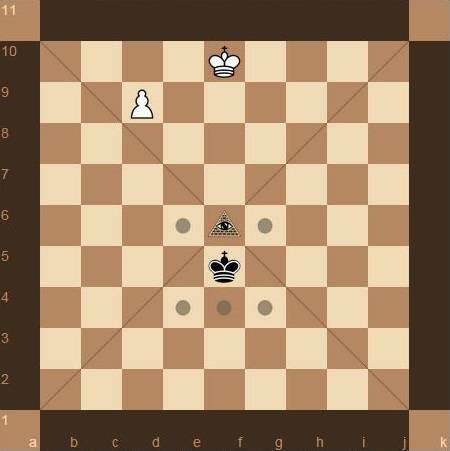 Although we imagined the white pawn will not move to e6 in the next move, but the e6 square is already attacked by the white pawn in current move therefore you are not allowed to move you king from e5 to e6. Now we understand how ASE works: since it doesn’t move or capture, its attack doesn’t impact any pieces except for kings. 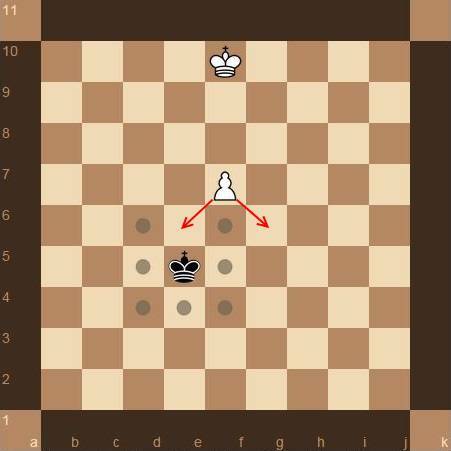 When it is white turn, ASE attacks the diagonal so the white king is not allowed to move to the attacked squares and when it is black turn, the black king is not allowed to move to the diagonals. In other words, ASE attacks the diagonal, for the player who should move. Note that the above situation NEVER happens in a normal chess game. Only in the Egyptian Eye chess variant, for the first time, you are dealing with such a situation. It’s black turn: black king is allowed to move to e6, g6, e4, f4 and g4, but it is not allowed to move to f6 (it is occupied by ASE, no piece is allowed there) and also not allowed to go to e5 and g5, because those squares are attacked by ASE. 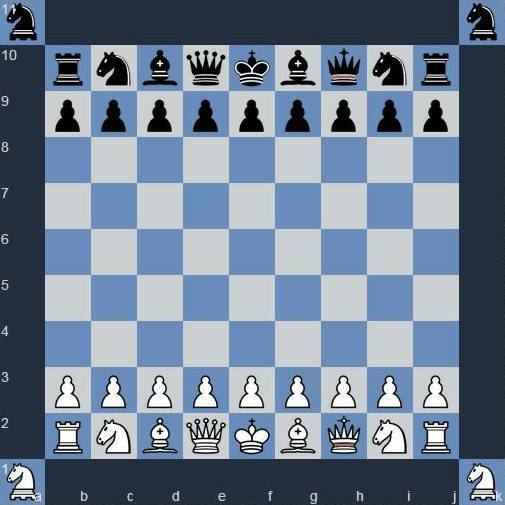 1- When it is your turn, you should to not only deal with the material of your opponent, but also to deal with another unexpected superpower chess piece which attacks your king on diagonals, and in contradiction, when it is your opponents move, you have a superpower at your side which attacks your opponent king on long diagonals. This unexpected change in the material balance in each half move, makes the positional calculation in this variant the most complex calculation in all chess variants. The ASE attack is not “random” (like many chess variants based on randomness and luck) The ASE behavior is logical, repeating and to be calculated, but such a huge material imbalance on each ply, makes ASE to “look like” an unpredictable piece. After playing enough games, you will see that your ability to predict ASE impact will increase and you can have a chance to win the game. 2- The Citadel squares which are positioned on the long diagonals are not available for kings, that means the Citadel rule (game draw) is impossible in this variant. 3- King might be in check by an opponent piece which is placed on diagonals, but cannot capture them, look at the following diagram. It’s black’s turn. For a chess player who is not familiar with ASE, the below diagram shows remarkable material advantage for white. Apparently … but not in the Egyptian Eye variant! The above position is a “mate in one” for black: by black queen to j2 -> checkmate! White has clearly underestimated the ASE attack. 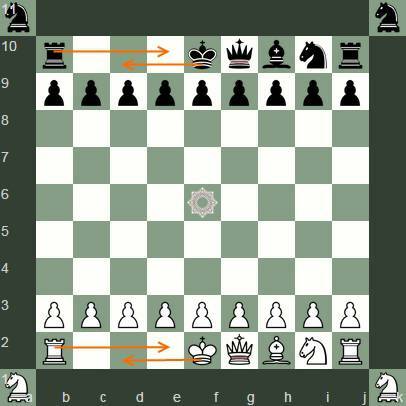 Although black queen in j2 looks very undefended and in every “usual” chess variant it could be captured by the white king if she gets so exited, but in Egyptian Eye the ASE defends the black queen by attacking the j2 square. Black queen has checkmated white in j2 square and ended the game. 4- ASE attack is x-ray and no piece can block it, as you see in the above diagram that white pawn in g5 and white knight in h4 do not block the ASE attack. 5- Castling has less advantage here and sometimes it has even disadvantages, since it exposes the king to even closer square to the attacked ASE squares on long diagonals. 6- No piece is allowed in the center square (including pawns and princess) which might cause the pawns on the f-file to be trapped on f5 or f7 squares (depending on the color) during the game. Because of this new piece on the chess board, the Egyptian Eye sub-variant is the most complex and difficult to learn sub-variant of the Persian Chess. This Persian Chess sub-variant is purely experimental and we still neither played nor analyzed enough games to be sure that it is bug free. Therefore it may still contain errors and bugs and the game rules might be subject to change. Wizard movement is slightly different than the original Omega chess wizard and it is not color bound, hence the different icon for this piece. The same rendezvous rule as the Persian Princess variant also applies here, champions can change place with bishops and transform a dark-square bishop to a light-square bishop.